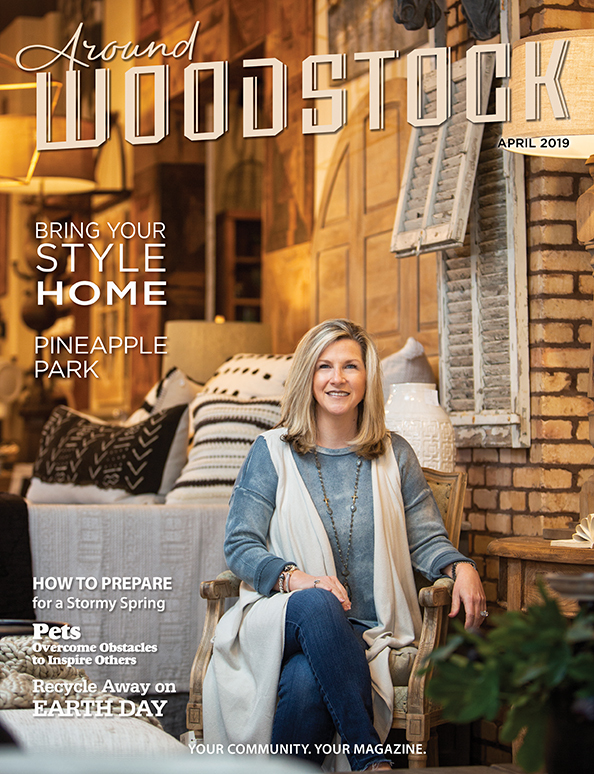 I have lived in Acworth for the past 20 years. 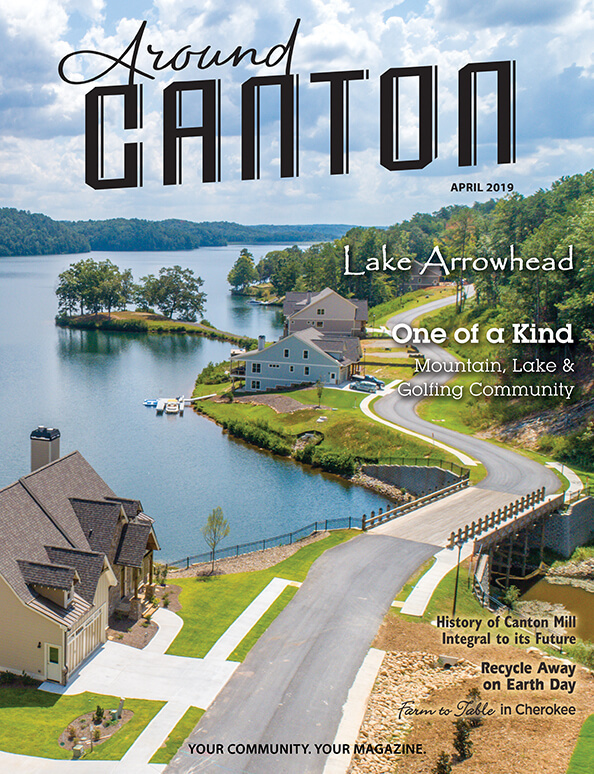 I am not a native Georgian, but I have grown to love this area and enjoy everything about Acworth. I was a tomboy growing up, just like my mother, and loved sports and cars. I acquired an aggressive interest in cars as a teenager. I loved fixing them up. My first love was a yellow, 1976 Camaro. Boy, that thing was pretty. I bought an old Chevy truck with a 350cc block and put it into the Camaro. I chromed out the engine and was working my way toward my first show car. Unfortunately, I let my brother drive the Camaro while I was out of town and he managed to blow the engine. The Camaro was trashed and I did not have the money to fix it. I sold what was left of the Camaro and went to college, heartbroken. Later, I attended car shows in Acworth and traveled to Pigeon Forge for car events along the famous Parkway. It was so exciting and I dreamed of having another opportunity to fix up another classic car and show it. I was drawn to the 1967-69 Camaro. However, with every car show I attended, there were so many of these cars I did not see any way to have anything special. I always liked the 1967-69 Firebird and shifted my attention on that car. Although I searched and searched for a Firebird, there were few to find. Firebirds were either fully restored and extremely expensive, or they were rust buckets with too much to fix. So I decided to do something entirely different. In 2011, I bought a base model Jeep Wrangler Unlimited Sport Edition. I thought I would go for the Black Ops look with black on black everything. The Jeep certainly turned heads for a while until Jeep themselves presented their “Black Ops” Edition Wrangler. Well, so much for that unique look. After much thought, I decided to create a unique, one of a kind, “Zombie Jeep.” So in 2013, the project began. I am four years into this Jeep project. Although the majority of the Jeep is complete, there are always more things to add or change. Since 2015, the Jeep has been in show condition. We have been in the 2015 and the 2016 Acworth car shows, we won the 2016 Zombie fest Jeep show in Canton, and we won the 2016 Best in Show at a car show in Marietta, benefiting the Marietta Police Department’s PALS organization. The “Zombie Jeep” has been such a huge success. We draw large crowds everywhere we go. All the smiles and laughter warm my heart. Both kids and adults appear excited to see the Jeep, which only confirms that the hard work is worth the response. The fans drive me to continue on with this project. There is a saying in the Jeep owner’s world – JEEP stands for “Just Empty Every Pocket” because you are never finished when fixing up a Jeep. 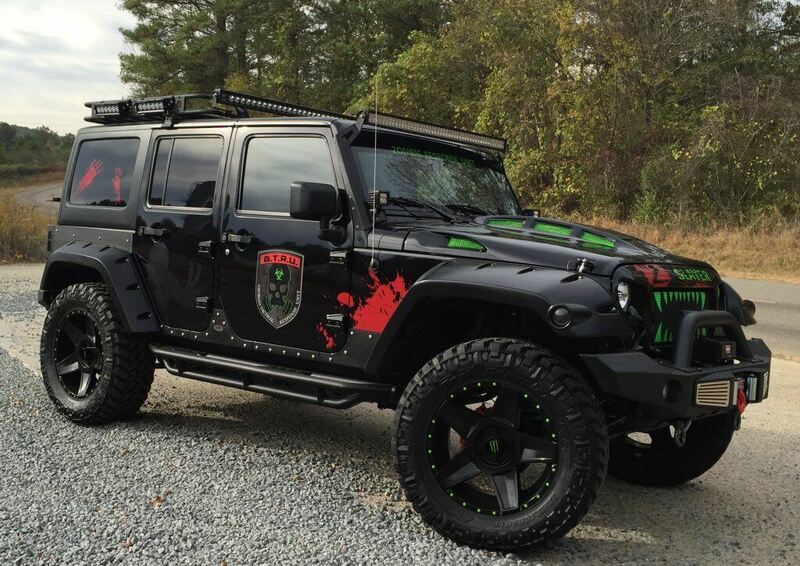 The “Zombie Jeep” has too many enhancements to list them all. 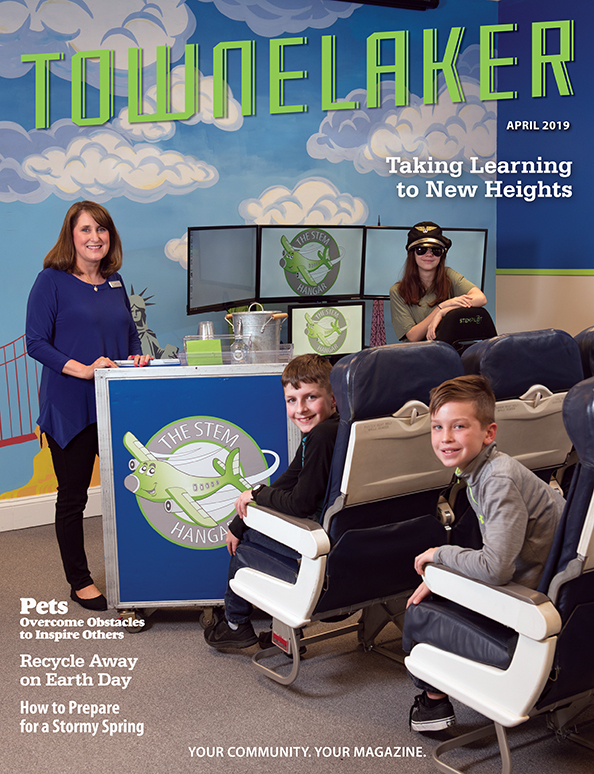 Highlights include green under-glow lighting, green lighting in the headlights and the hood vents and an entire roof rack loaded with green lighting. 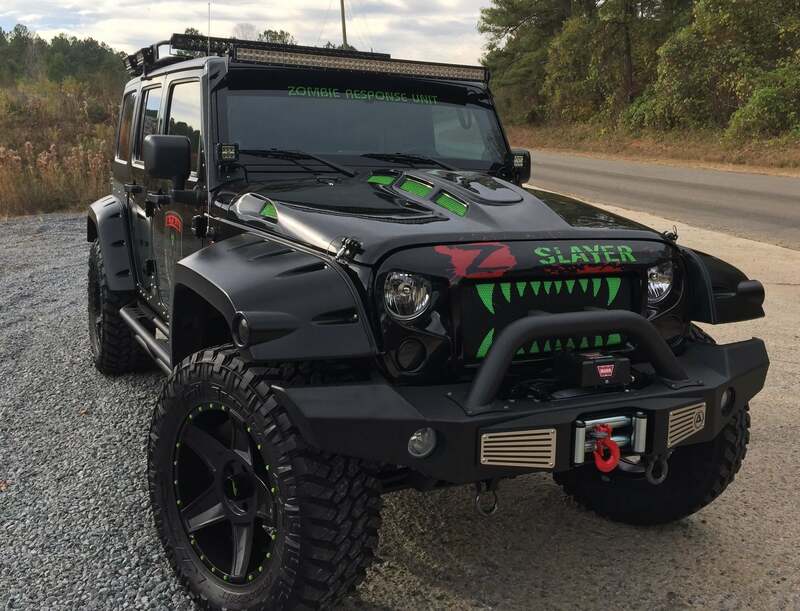 The “Zombie Jeep” glows green at night. Z-Slayer features non-working prop guns. We are a huge hit driving in neighborhoods during Halloween handing out candy. 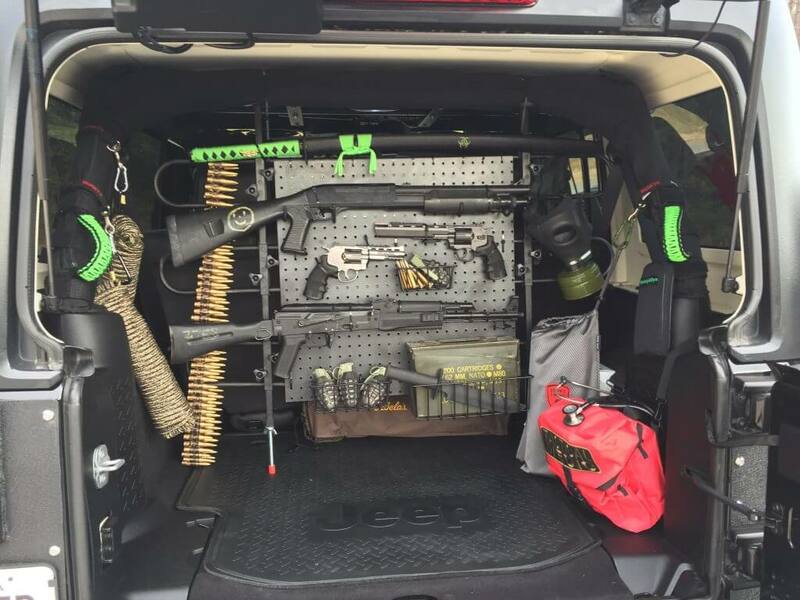 There is a stockpile of weapons for fighting the zombies in the back of the Jeep. No worries, these weapons are props, as is the huge Browning M50 machine gun replica that sits on top of the Jeep. The replica took me four weeks to build in the garage. We are very proud to present to everyone, the “Z-Slayer.” Yes, she now has a name she wears proudly to let everyone know she means business. We plan to continue entering “Z-Slayer” in car shows. Additionally, we have plans to allow the Jeep to sit at special events such as birthday parties, grand openings, Jeep dealership events, and at the Walker-Stalker conferences across the country. To answer the main question on everyone’s mind, “Are you a Walking Dead fan?” Yes, indeed. 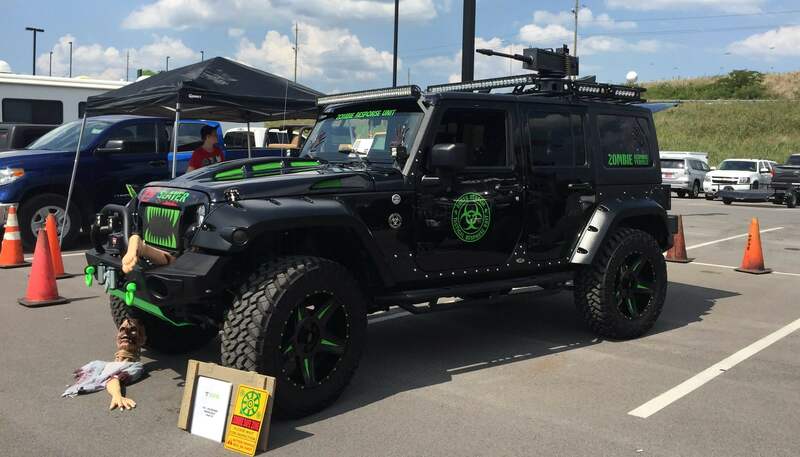 Our main focus is on the zombie apocalypse, but we do want people to know that the Jeep is an actual survival vehicle. We have medical equipment on board, MREs, water jugs, fire equipment, and have plans to become a certified part of Georgia’s disaster response team in the near future once we finish a few more additions necessary for responding to real emergencies.